In this episode we introduce you to albertaJOBcast and how employer profiles and job ads published as audio and video podcasts on social networking sites such as Facebook, YouTube and iTunes can help a company recruit staff from the Gen X and Gen Y (18-35 year olds) demographic. You might not Facebook, but they do! And in ever increasing numbers. Talking about my new portable podcasting gear (BRASSmedia is on the road!) and using SKYPE and Call Burner to record interviews over the phone. This episode is from our sample CD which we handout at tradeshows and during sales presentations. 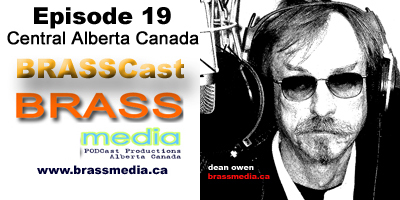 If you would like a FREE copy of the BRASSmedia Sample Podcast CD – (now with bonus tracks and video) send us an email at: dean.owen@brassmedia.ca with you name and address and we’ll send one out to you right away. OR – you can call us at 403-896-4956. The audio version of my blog post “Some Podcasting Numbers” originally posted on January 11, 2008. BRASScast Episode 12 – White-label social networks – have it your way! We had the pleasure to work on this BrassCast with a good friend, Marilyn Pottage who, along with Marilyn Ganger, spent many months last year distributing text books in the Damongo area in Ghana. This is a great example of how existing content can be reused to produce an episode for a podcast. Her original project – Tools for Schools – Africa, Damongo Project can viewed at www.tfs-africa.org. Details for her new project can be viewed at http://www.givemeaning.com/project/damongo. 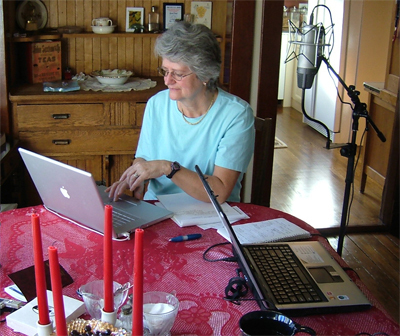 Marilyn Pottage was giving public presentations of her Tools For Schools project in and around the area. We got together to convert it into an online video which they could distribute via the web – YouTube, Google Videos etc and play in DVD format at live events, and to distribute as a promotional item. I look forward to working with Marilyn on more episodes for this project and when she returns from Africa in 2008 with more content from her new project. Thanks Marilyn! Now onto the next project . . .
Blogging and podcasting is a great way for your local government to connect and communicate with their constituents. In this second sample we have a craft supply store – the Craft Barn, which services its customers through both a brick and mortar location and online via their e-commerce website. This format is short and to the point in providing information about the use of one of their products. This helps establish them as a knowledge leader. The target of their call to action here is to take listeners to their online store. The Craft Barn produces two podcasts a week. They are planning on producing some video podcasts showing individual tips as well as time compressed projects in order to keep them under a target of 15 minutes per episode. The video phase will be started when they meet a target number of subscribers. Another venue they are considering are ‘PDF casts’ which are craft projects published as PDF documents and delivered via RSS subscription feeds. They also promote their e-commerce site and podcasts through traditional media such as their week newspaper flyer and inserts into shopping bags during the cash out at the time of purchase.